The YMCA’s swim lessons use a variety of fun methods to help kids overcome fears, build confidence in the water and develop skills that last a lifetime. Qualified instructors tailor lessons based on participants’ age and ability level to give them the skills and knowledge they need to be safe in the water. 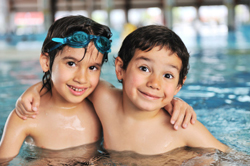 Group swim lessons consist of 6 lessons starting on the 1st Tuesday of the month. Lessons are on Tuesdays and Thursdays the first 3 weeks of each month only. Private lessons are also available for participants wishing to receive one-on-one or more personalized instruction.